Melton is an old village. The site has been settled at least since the 11th century when it is first mentioned in written records. It appears in the late 11th century Domesday Book or the Great Survey which was compiled on the request of William the Conqueror. 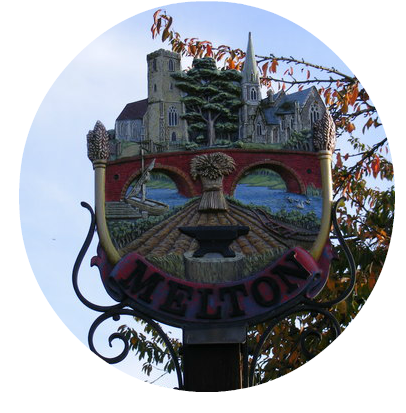 However, many local historians are convinced that history of Melton dates back much further. Possibly as far as the Roman period or centuries before the village’s first record in written sources. Melton is virtually just around the corner of the Sutton Hoo, one of the most important archaeological sites from the early medieval period in Britain. It is known as the burial site of Rædwald of East Anglia (r. 599-624) although no conclusive evidence has ever been found to support the claim that Sutton Hoo is his final resting place. Despite that, the quantity and quality of excavated Anglo-Saxon artefacts is extraordinary and the site’s significance for the study of the Early Middle Ages cannot be emphasised enough. Since Sutton Hoo lies less than one mile south east of Melton, some local historians are convinced that the village must be much older than formerly thought. In the 1760s, Melton became home to the so-called House of Industry which was built by the Loes and Wilford Hundred Incorporation. One of the most significant buildings in the village to this day, the House of Industry operated until the mid-1820s when it was dissolved for failing to bring the expected results. In 1826, it reopened as the Suffolk County Asylum for Pauper Lunatics which was renamed as St Audry’s Hospital in 1916. It operated until the 1990s when the asylum was closed, while the building of the former House of Industry became a residential property. The East Suffolk Railway arrived to Melton in the late 1850s, providing connection to Ipswich in the south and Lowesoft in the north. The railway operated until 1955 (from 1923 as the London and North Eastern Railway and from 1948 as a part of the British Railways) when it was closed. However, due to repeated calls for the reopening of the railway station, the latter eventually reopened although it took nearly thirty years for the villagers to succeed to return the railway to Melton.